After a few days without connection, we're back with some news! We have used these days to complete some of the older articles, enjoy the reading! After Ilulissat, the contrast is quite accentuated when we moor in a little bay off Sarqaq, a little peaceful village home to the arctic garden that once belonged and was cared for by Hanibal Fencker. 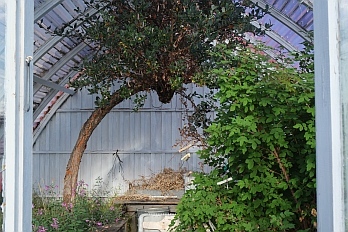 Two big greenhouses are the shelter to numerous plants. When we open one of the doors we are welcomed by the image of a little tree just as tall as us and the aromatic smell like we haven't smelled in a while. 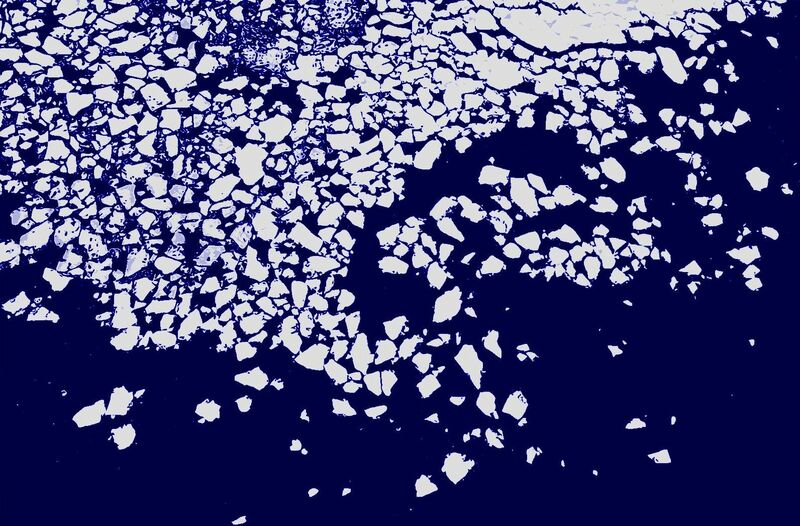 In the fjord enormous blocks of ice lie peacefully close one to another. In the evening we are surprised by fireworks. The people of Sarqaq are celebrating! There is joy in the laughter, the music is loud! It is Saturday, time to celebrate, also on board. The next morning we continue our way. In front of us we have the Vaigat: an unprotected passage to the North of Disko Island. It is 6o miles long and 10 miles wide (twice de size of the Lac Lman), with no really mooring possibilities. To the North we find the Nugussag peninsula, crossed by big semidesertic valleys leading to high, snowed-in peaks. It presents itself as a magnificent hiking area, ready to be exploredÉ We could spend weeks here; definitely a place to come back to! The following days are marked by the welcomed presence of the sun. We are heading north; every degree we get closer to the North Pole, leads to the loss of a degree in the height of the trajectory of the sun. The scarce flora is changing its colours from green to red and orange. Everything seems to retreat back into its roots. The cormorants are heading towards the South. The winter is approaching. After spending the night in the cover of a big wall S of Nugsuata (**), we head to Niaqornat (***), the Village at the Edge of the World. It is a meeting point between arid mountains and the rough sea. Time passes differently here. It is a village of contemplation. At the beach the grandfather plays with his grandchildren, throwing stones. The only person that speaks english manages to download the GRIB files for us. 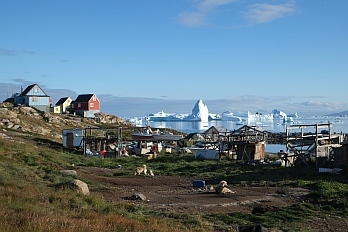 Internet access exists in every inhabited village in Greenland. Therefore, we use the mobile coverage maps, to find out if a place is inhabited. After a short crossing over the Ummanaq fjord, we arrive in the Upernavik area (****). The landscape completely changes. The deep valleys and volcanic formations change to round polished granite. 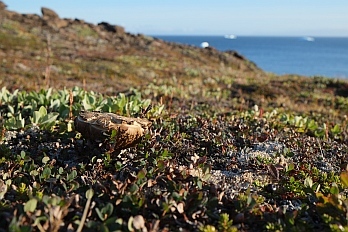 While the mushrooms dry on the navigation table, we cross the 70th parallel N.
(*) Sarqaq (70°00'N 51°57'W): good anchorage inside the little bay to the S of the small village. Protected to the S by a little island and 1m shoal. Excellent hold in sandy bottom (5-10m). Fuel available on the peer. Small shop. Nosy-Bé wintered here in 1996. Well mapped on charts. (**) Temporary mooring to the S of Nugsuata (70°40'N 54°34'W): well protected from the dominant winds from NW and SE. Open to the sea to the S and W. Good hold in rocky bottom covered with algae (11m), close to a pebble beach at the foot of a stone wall. Volcanic origin. Surrounded by beautiful valleys, with mushrooms and berries. Some Inuit tombs. (***) Niaqornat (70°47'N 54°34'W): Small village installed on an isthmus. Beautiful surroundings with great hiking possibilities. The mooring is situated on the W of the isthmus. Good hold in calm weather in 15m sandy bottom around 15m from the beach. Open to the NW and only protected by big icebergs grounded on the shallow bottom. (****) Mooring to the S of a glacier 'moraine' at the W entrance of Amitsup Suvdlua (71°49'N 55°24'W): Good hold in 10m sandy/algae bottom. On the shore there is an old hunting cabin. The 'moraine' is not shown on charts but can be seen on satellite images. Arid surroundings, amazing hiking terrain! Close to the beach there are some rests of turf houses and a tipi camp. For the last days we have been slowly proceeding north. The extensive archipelago along the coast offers the most numerous oportunities to explore the different landscapes. During the day we enjoy the calm and protected waters between the islands. In the evening, after securely mooring in a small bay at the foot of some mountain or the mouth of an extensive valley, we go for a hike in the surroundings. Today, after searching a mooring, we make a stop in a little village with about 20 small houses. Only 5 minutes after arrival, we are approached by Stephen. He is the teacher. He invites us to come to the school for a morning coffee. He asks if we could talk about ourselves and what it is that we are doing. 20 pairs of young eyes stare with excitement, carefully listening to what we are saying. There is joy: the children gloat with enthusiasm and present big smiles. We are touched by the openness and kindness of our hosts. 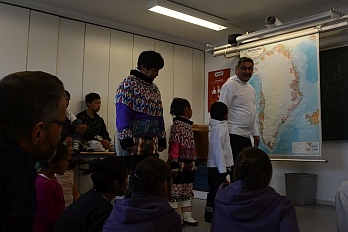 The young Greenlandic woman who will take over the teaching in the village thanks us for the visit. We are grateful for the kind and humble invitation to spend a day among these kind people. We'll come back! Travelling with a boat somehow opens doors towards people, allowing us to exchange ideas, share thoughts and, mutually learning from one another. 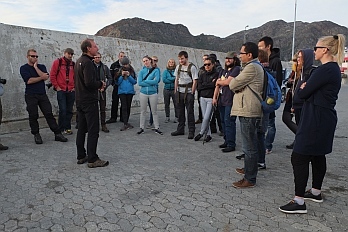 Martin, for example, is researcher in building physics for the Danish Technical University and our contact in Sisimiut. His domains are ventilation and thermal insulation in arctic regions, topics that are not strange to me. He shows us the two prototypes of passive buildings that exist in Sisimiut, welcomes us to his lab and offers us the services of his workshop. This allows us to fabricate the mast for our windmill. In return we organise a conference and tour on board for the students of the summer camp. We will stay in contact, the first results of our expedition are awaited with great interest. After spending a night in Quequertarsuaq, Disko Bay, we head to Ilulissat. Surrounded by blocks of ice, it's a busy city, marked by tourism; Greenland's Chamonix. We find nearly everything that is still missing, at high prizes obviously. Most importantly though, coincidence has it that we lie side by side with Vagabond (link). Eric and France share with us precious information and advice about the region we are heading towards. More importantly they share with us moments of first friendship. Meanwhile their two daughters, Leonie and Aurore, spend the day together with our young crew. Later, a customs-agent comes on board. He had seen us loading dog food onto our deck and wanted to make sure we didn't have any dogs on board coming from the south. They would have to be castrated in order to preserve the Greenlandic sledge dog gene pool. The day passes too fast between buying what we need and visiting the town and the three expedition boats: Vagabond, Atka(*) and Nanuq(**) - all full of innovative and unusual conceptual ideas. They are floating innovation labs. 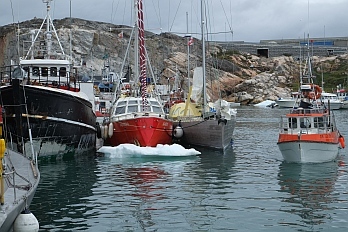 At 22 UTC, after a long day, we cast off 5 miles to the North of Ilulissat into a little bay. More and more the maps become schematic, giving us less and less detail and more discovery. 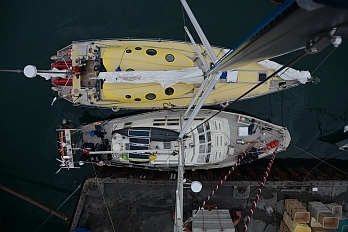 () Sydbay (67°13'N 53°53'W): In contrary to the instructions found in Imray, the anchorage to the N is not strong enough for strong winds (20knots) from the S (to deep and to many algae). Excellent hold can be found to the W of Ukivik in 12m sandy bottom. Protected by several awash rocks to the SW of the island. Visiting the island is recommended: the view from the light house and the the well conserved turf house are extraordinary. (*) Ikerasarsuq (68°08'N 53°27'W): The rocky and deep bottom is not suited for mooring. There is however a little peer suited for a short stop. The small village lies out of the way of the main touristic route. 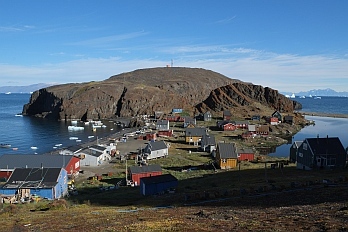 (**) Hunde Ejland (68°52' 53°07'W): Small unvisited village situated on an archipielago at the entrance to Disko Bay. Approach to the little harbour through the N/S channel to the E of the archipielago. Aim towards the little peer to the W, avoiding the visible rocks. There are some 6m shoals. Fresh water is produced by reverse osmosis. Bredebugt (69°16'N 50°58'W): Small bay on the S side of the main bay, 5M to the N of Ilullisat. Good hold in 6-8m sandy bottom. Depth close to shore is around 5m. Size limit, the use of land lines may be recommended.